Looking Ahead: Where to find CAP during summer 2019! As all MSU students, professors, and staff know, MSU is continually improving their roads, sidewalks, sporting fields, etc. Each spring through fall, MSU’s campus is scattered with constructions sites with the goal of bettering the physical campus environment. While this activity is very visible, there is much that goes on behind the scenes. Multiple parties are involved in the planning stages, including the Campus Archaeology Program. In order to achieve our goal of preserving the cultural heritage of MSU, we must understand where construction will take place, what kind of work will be done, and then generate our own plans for mitigating any possible damage to archaeological sites. Throughout the year, MSU Infrastructure Planning and Facilities (IPF) (https://ipf.msu.edu/) is working on construction plans and creating maps and documents for each change. (See the IPF website to read more about their project phases: https://ipf.msu.edu/construction/business-partners/project-phases.html.) CAP comes into the picture around the ‘Construction Documents’ phase, when we can meet with staff at IPF and go over the upcoming planned construction. I personally attended my very first meeting with IPF this past week, alongside Dr. Goldstein, Dr. Camp, and Lisa Bright, where I was able to learn about the upcoming construction this summer and see all of the incredibly detailed plan maps that have been created for each project! At this meeting, we discussed construction that will begin in April on the Service Road soccer field and in May along Wilson Road. There are so many advantages to meeting with the employees at IPF, including seeing the great detail within their plan maps. These maps allow us to determine what type of archaeological survey needs to be conducted before they begin construction, as well as how CAP should approach monitoring the work once it has begun. At this meeting we also discussed their timeline for the construction projects, as well as when it would be best for us to conduct our survey of the impacted areas. It was a great experience, and taught me a great deal about the extensive planning that takes place within our collaboration with IPF. Now that we have met with IPF and have determined where on campus construction could impact archaeological sites, CAP must determine our survey methods for these projects. Currently, our plan stands as follows: as soon as the snow melts and the ground thaws a little (hopefully in early April), CAP will begin to survey, using a grid of shovel test pits, within the Service Road soccer field. During this survey, we will record and collect any archaeological evidence recovered. Once our survey is complete and construction begins, CAP fellows and summer field crew employees will then monitor the work for any further evidence of archaeological sites or artifacts that may have been outside of the initial survey. In addition to surveying and monitoring, CAP also conducts archival research prior to construction projects, combing the written record for documents related to historic MSU campus in the areas of impact. 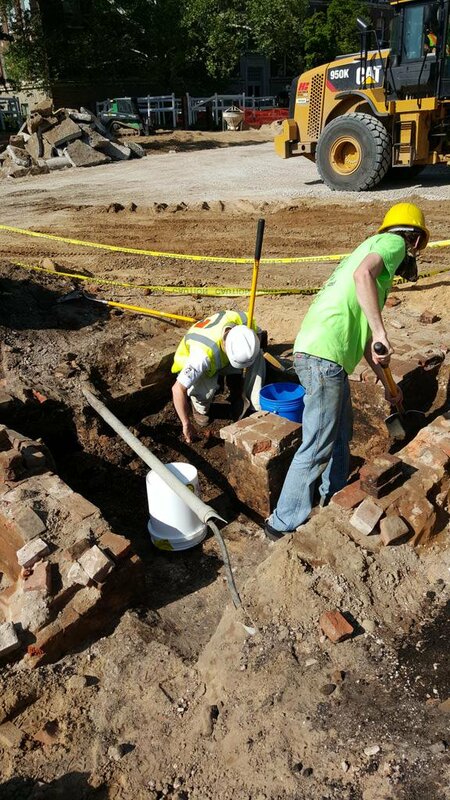 The combination of archaeological survey, monitoring construction, and archival research will ensure that we are doing everything that we can to protect MSU’s archaeological heritage! Keep a look out for us on campus! 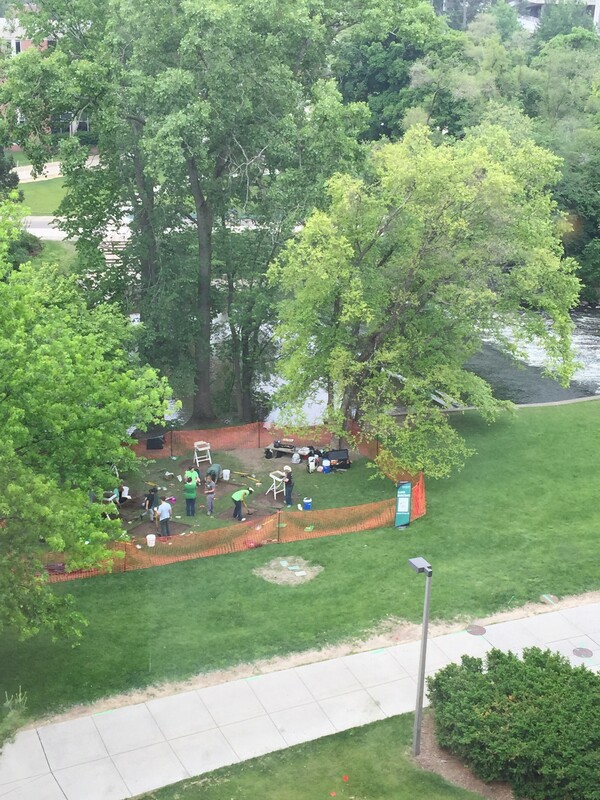 This summer we had the opportunity to excavate in several different areas of north campus. 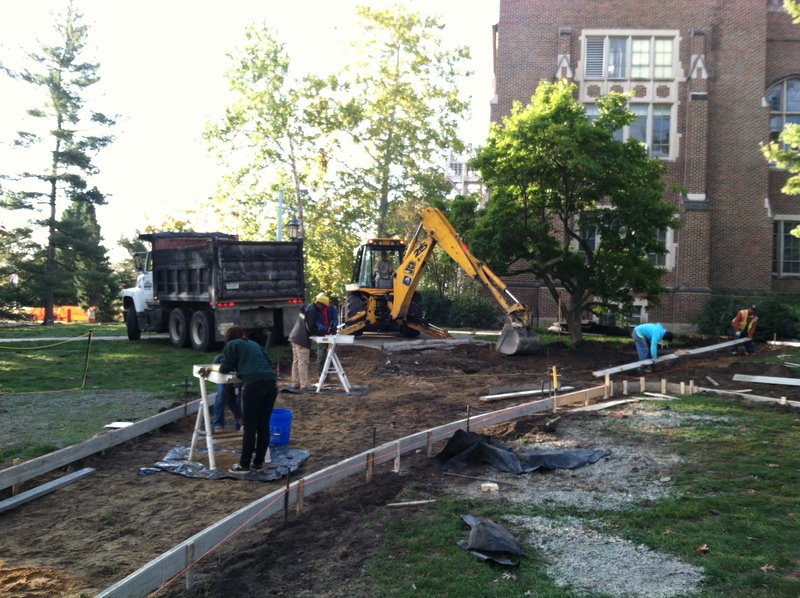 We began the summer working in conjunction with the Abbot entrance landscape rejuvenation project. This required us to survey down the center median, as well as either side of the road. I talked briefly before about the general history of this area, as well as a summer progress update. We were able to locate the basement of Station Terrace. Chances are you’ve never heard of Station Terrace. The building stood just east of Faculty Row, near the southern end of the current Abbott entrance median. There’s not much information out there regarding the building, but we do know that it had many different identities during its life on campus. Station Terrace was likely built during the 1880s or early 1890s (the earliest photo documenting the building is from 1896). Its original purpose was to provide housing for researchers visiting from the M.A.C. experimental stations. Later it was used to house bachelor instructors, earning its nickname the Bull Pen (perhaps also acquired as a counterpoint to Morill Hall’s nickname the Hen House). During the evening of January 24th, 1903 the building was damaged by a fire started by a faulty chimney. There were several issues in the containment of the fire, including many of the volunteer fire fighters being at a society room party, lacking the proper wrench to screw into the closest hydrant, a frozen fire hydrant, and a burst water main. They eventually got the blaze under control, but substantial damage occurred to the west end of the building. However, it was recommended that the building (as well as other areas on campus) become outfitted with modern fire extinguishers and hand grenades. Following the fire, some board members suggests remodeling the building, and changing it into a two family household. 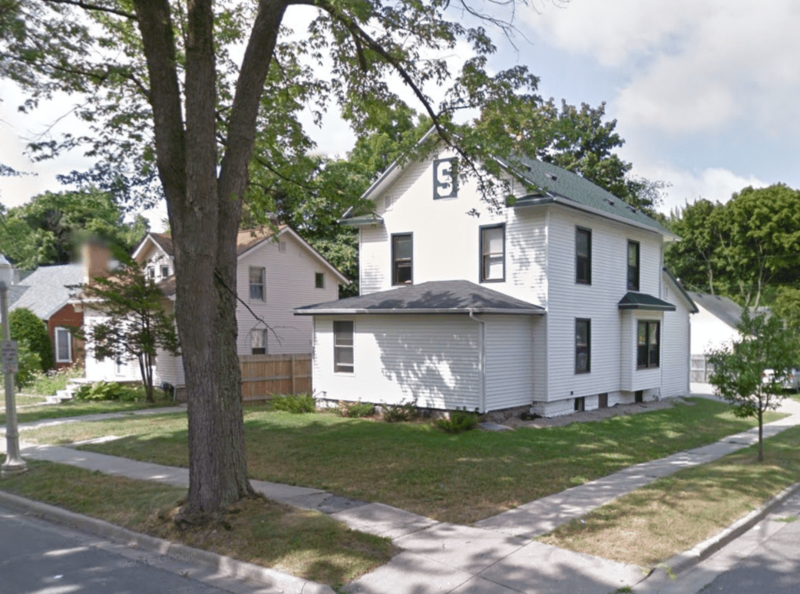 They went as far as to have the college architect prepare a sketch for the remodeling, but ultimately decided that they would derive more revenue and benefit from restoring the building to its former state with several apartments. 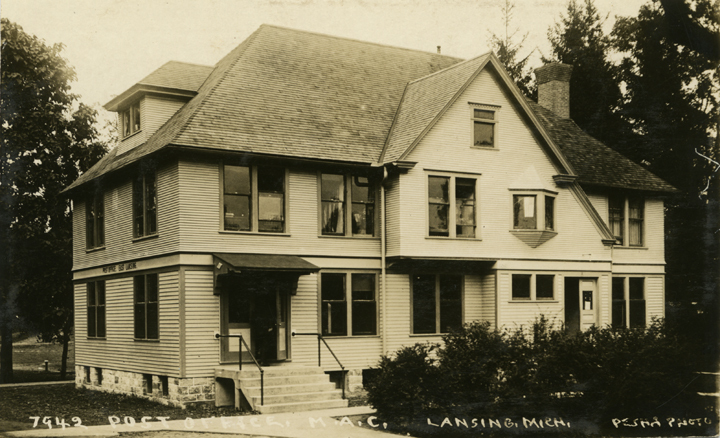 Between the spring of 1903 and 1923 the building housed the East Lansing post office. Because of this Station Terrace is often referred to as the old post office on maps and in historical documents. In 1902 after the demolition of the original trolley car waiting room, it was moved to Station Terrace. In 1921 the old college waiting room was taken over by the Flower Pot Tea Room, a café run by women in the home economics program. Station Terrace, as well as several other buildings, were in the path of the Abbot Road entrance construction. However, the building was not demolished. 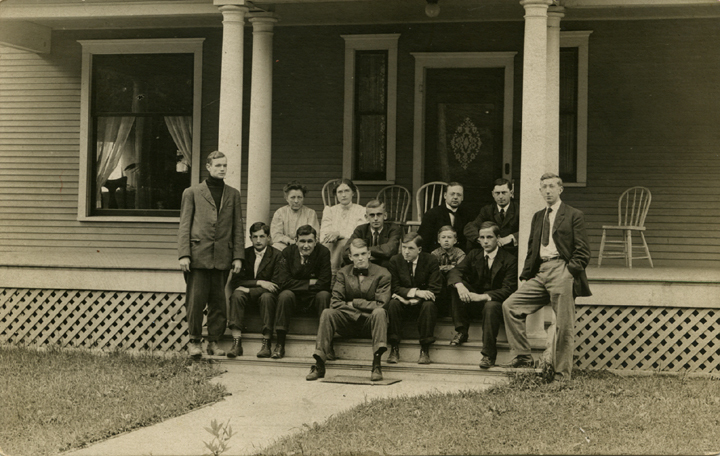 In 1923-1924 it was moved off campus, to 291 Durand Street. The structure was also modified, and portions of the building were used to build the house next door. From the right angle, it still bears a slight resemblance to its former arrangement. Because the building was physically moved off campus, and not demolished, collapsed, or burnt down like many other buildings we excavate, I was unsure what we would actually find. I was pleasantly surprised. During our final row of STPs we encountered a large fieldstone at the depth of 1m. This unit was expanded, and expanded, and then expanded some more. We had located an interior dividing wall, in what I feel is the basement of Station Terrace. 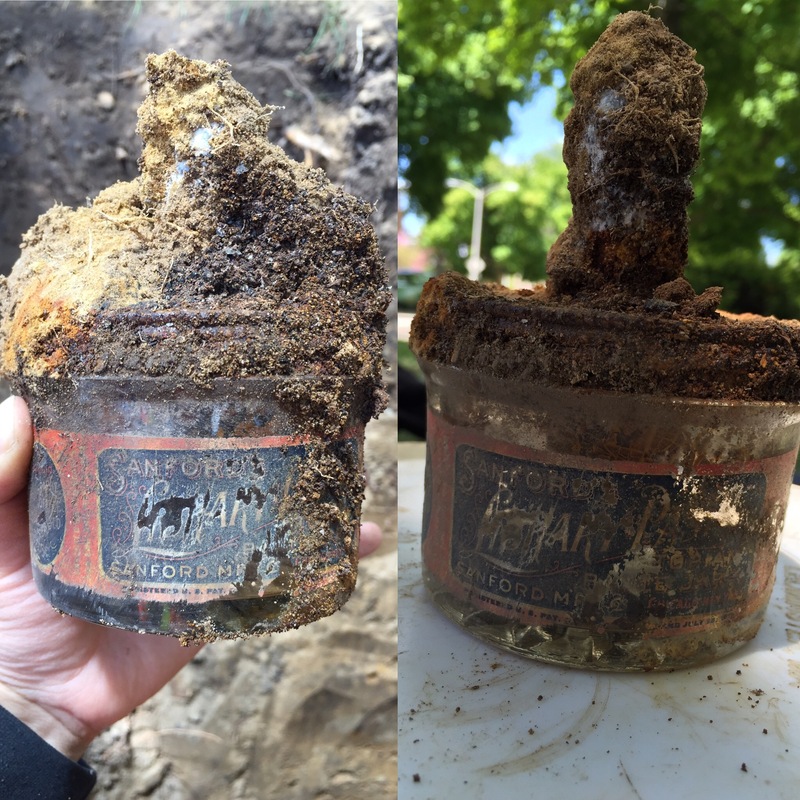 Further excavations revealed a concrete floor, water and sewage pipes, concentrations of sheet metal, an intact paste jar (more on this jar coming in a future blog! ), and a pair of men’s shoes. The east side of the unit also contained some beautiful stratigraphy. I’m still busy conducting more research on this location, and its possible suitability as a location for the next field school. Justin L. Kestenbaum, ed. At the Campus Gate: A History of East Lansing. 1976. Board of Trustee Meeting Minutes Notes: 1903. 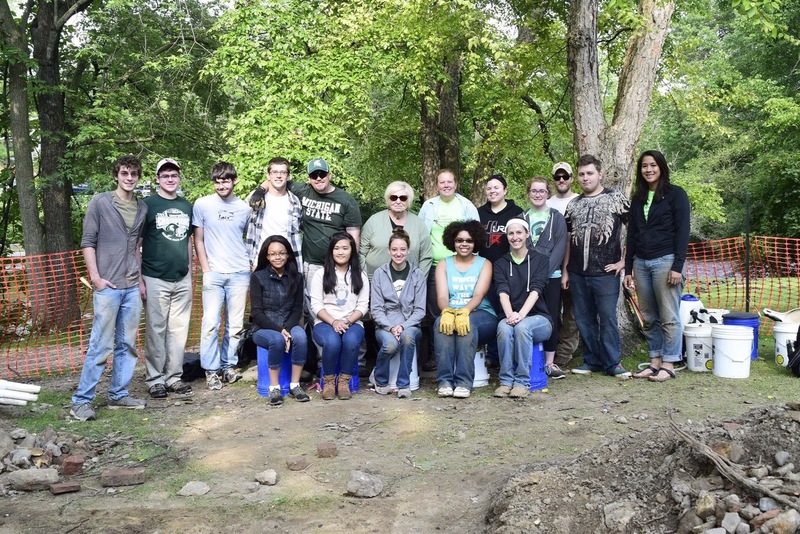 Here at Michigan State, we have finished the field school, completed most construction-related projects, and are cleaning artifacts, organizing things and preparing for the new school year.  I (Lynne Goldstein) am personally doing conference calls and trying to catch up on a variety of things that are due. “Sometimes meetings are very enjoyable. Just returned from a meeting about new campus historical markers, focusing on the “Sleepy Hollow” area. MSU wants to include info on the prehistoric site we found at the edge of the hollow, as well as info the MSU Campus Archaeology Program has on historic sites and events in the area. The Lansing State Journal ran an article this week on archaeology in Michigan, and we are very pleased that we are featured, along with Fort Michilimackinac and others. 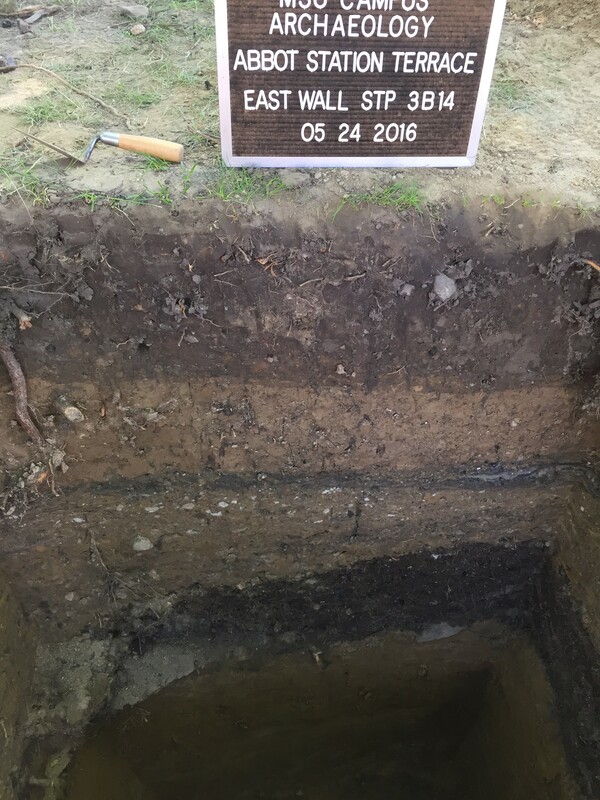 Our regular CAP posts continue, and this link tells you about the outhouse we found which is probably linked to Saints Rest, the very first dormitory on campus. We are very excited about this find because we have been searching for an outhouse associated with the dorm for a long time. Archaeologists like outhouses (well, old ones that don’t smell anymore) because no one goes after anything they dropped into one, and people also often used them as a dump for debris. We do have some sidewalk work to do on campus, and this often yields really interesting things. The University replaces sidewalks with some regularity (they are now trying to install “green” sidewalks everywhere), and there is often undisturbed stuff beneath the old sidewalks.